Ink and blood stain the streets of Ramezia. Witches must burn and sins must be judged. Venture forth as Sister Semilla to burn down the pillars of heresy in Minoria, an action-platformer by Bombservice, creators of Momodora. 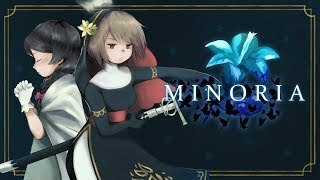 Minoria is the latest and most ambitious game from Bombservice, and a spiritual sequel to the Momodora series, from the same studio. Fans of Momodora will find familiar aspects in the design and gameplay elements, as they master the ins-and-outs of parries, dodges, and a variety of different spells. The presentation has evolved to an HD format, with aesthetics mixing 2D hand-painted backgrounds and cel-shaded characters. The story takes place during the fourth Witch War. It is a time of fanatical religious fervor. On the one hand, by the Sacred Office, a powerful organization leading an Inquisition against heresy, in order to purge the sinners who threaten humanity. And on the other hand, those labeled “witches”, responsible for conducting a mysterious ceremony that contradicts the rules of the Church. Set forth with Sisters Semilla and Fran, missionaries in the Church’s service, on their journey to thwart the witches’ ceremony and protect the common-folk from heresy that endangers the status quo.